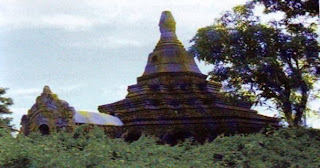 Buraoat pagoda is situated on the hill which is 50 feet high and half a mile away from the palace site. As the country was in chaos, after Htoakkanthein pagoda had been built, king Min Pha Laung built Buraoat pagoda as a monument in AD 1571 in order not to disintegrate the country. After the upper part of the pagoda had already ruined, one terrace only remained. The terrace has twenty nine small caves nad twenty nine Buddha images dwelled in those caves. The stone Buddha image which is 13 feet high, is on the lotus throne inside the chamber at the eastern entrance.